The moment was almost magical: the riders had started in a cold and tenacious mist in the morning in Echternach and suddenly emerged from the grey on the heights of Mont-Saint-Nicolas to see blue sky and enjoy of some of the magnificent views that the Grand Duchy of Luxembourg can offer. The beautiful autumn sun had decided to accompany them for the rest of their journey, warming their souls and also their hands, freezing after a more chilly than expected morning start. The thighs and calves were already since long, however: the course was tough, once again, and as of the first kilometers of race, the speed was high and selection took place. They were still a hundred in the lead group of course A after ten kilometers and a first climb, then fifty, then fifteen after the main difficulties of the day. In the end, of course, the was only one left, one winner. Or four of them, more precisely, each for one race and gender: three riders from Luxemburg (Ivan Centrone, Rick Stemper, Anne-Sophie Harsch) and one Belgian (Ils van der Moeien) took the flowers this year. Some 1360 participants lined up this Sunday morning in Echternach, a new record in the nearly thirty-year-old history of La Charly Gaul: they were 1288 in 2013, the year of the previous record. A hundred or so riders experienced bad fortune along the way and thus did not finish the race: 1250 competitors arrived at the finish by respecting rules and deadlines, thus finding themselves in the different rankings. Among them were also two former yellow jerseys of the Tour de France, Frank Schleck and Kim Andersen, as well as Bob Haller, multiple champion of Luxembourg in triathlon. Approximately 40% of competitors opted for the 160 km long route, confirming the tendency in recent years for a renewed interest in this most difficult course. They were 540 to take the start this year against 491 during the last record in 2015. On the shorter distance, the 2017 edition was not the best of all time since in 2013, with 827 riders, they were only a few more than this time. While the increased popularity of the A-course over the past few years has been confirmed, the female participation is also increasing, very slowly but surely. In 2017, 80 girls participated in La Charly Gaul (around 6%), compared with only 60 in the 2013 edition. Twenty-two brave women have started this year for the long distance, one more than in 2014 and another record beaten. 30 nationalities were present this year in Echternach, but nothing very new as far as the origin of the majority of the competitors is concerned: as in the other years, two thirds of them are from the Benelux states and 92% of all participants come from the neighbourhood countries of Luxembourg. 396 Belgians were the most numerous at the finish in all categories combined, a hundred units exactly ahead of the Luxemburgers (296) and far ahead of the French, third on this virtual podium with 173 riders to finish the event. As always, there were also Danes, Italians, Britons, Slovenes, Czechs or Irishmen in Echternach, while the exoticism came this year from several Finns and Hungarians, a Canadian, a Chinese, a Greek, a Turkish citizen or Bulgarian Spas Gyurov, who is not unknown to the ACC Contern since he has already finished on the podium of a Grand Priz OST-Fenster, several years ago. To finish this statistics chapter, lets have a word about the two true heroes of La Charly Gaul: Yves Lehnert finished his 28th edition in 381st place with a really good average speed of 27 km/h, while Nico Thoma is ranked 491st, also on the long distance. Both of them having thus participated in all the Charly Gaul without exception from the beginning. The course of the 2017 edition was a huge success, at least as far as the longest loop of 162 km is concerned. The climb of Mont-Saint-Nicolas with its views of the Castle of Vianden was a first highlight, both on the sporting and the touristic aspect, while the trip to the region of Kautenbach, Alscheid, Nocher and Dahl gave some breathtaking views to all those who took the time to enjoy them. The detour to these region was really worth the effort with the trilogy of climbs Alscheid (4.6 km at 4.6% gradient with lots of hairpins), Nocher (2.7 km at 7.4% in the green forest) and Hoscheid (4.5 seemingly never ending km at 5.6% gradients) near the middle of the course. These three obstacles surely gave problems to more than one of the competitors of the Charly Gaul A, which was perhaps the most difficult of the last years. After the reunion with course B, which was exactly 60 kilometers less this year, there were more big difficulties: the climb of Reisdorf (3.5 km at 6.6%) with another series of beautiful landscapes and the climb of Consdorf (4 km to 3.7%), from a slightly different side than usually made another selection, before the riders found somewhat less imposing hills in the last kilometers. The final has been unchanged for quite a few years now with the traditionnal descent through Girst and than the last part on the flat, in the valley of the Sûre river until the finish line in Echternach. 540 riders took the start for the 162-kilometer course in the fog on the market square in Echternach. But from kilometer 0 and the first slopes towards Berdorf, the pace was very fast and the racing offensive. Lex Reichling pulled out of the top group ahead of the summit with Anthony Spysschaert just a few meters away. The Belgian is a usual client at La Charly Gaul and he was already several times in one of the early breaks. He joined Reichling in the lead while a groupe with Wietse Kamp, Ivan Centrone, Felix Schreiber, Jonas Heymans, Michael Ossieur, Fabien Schmitt and Hedwig Van Landeghem in the first rows was not far away, followed by a very stretched peloton on the verge of break but not yet truly torn up. Martijn Henneau joined the two leading men in the descent to Grundhof, but the peloton led by Jonas Vercoutter had them within sight. There was a dozen kilometers of flat following during which the leading trio was caught and a large group of nearly 150 riders found together at the front, tackling the climb of Hoesdorf together. Defending champion Ivan Centrone upped the pace for the first time, breaking away with Martijn Henneau, one of the most active riders since the start. A few seconds behind them, a group of about a hundred units, led by Reichling and Van Landeghem, was still together but decreased more and more during the next kilometers. The climb to Groesteen made another big selection, and they were a forty still ahead on the high plateaus in direction of the first food Zone. Three men broke away as Kautenbach approached, but in the countless hairpins to Alscheid, the chasers led by Ivan Centrone were not far away. The trilogy of climbs Alscheid, Nocher and Hoscheid had the predicted effect on the group and they were only seven riders together at the head of the race after Merscheid, although there were still more than 80 kilometers to the finish and the reunion with the riders of the distance B was imminent. Up there at the front was Ivan Centrone of course, the defending champion who had won the Grand-prix OST-Fenster in Bech, early in the season, on roads where this Charly Gaul will pass later in the day. Next to him, there was Anthony Spyschaert, already three times third in La Charly Gaul (2010, 2014, 2015), Sandro Dostert, the rider from UC Dippach who finished 9th during the last edition, Frederic Glorieux, second in Echternach in 2015 as well ad 2016, Bart de Vocht, multiple Belgian champion of mountain-bike and accustomed to Top 50 rankings in the cross-country world cup, Sebastien Legand, an experienced Frenchman who is used to ride (and winning at times) in Walloon races, and finally maybe the biggest favourite of all: Pit Leyder, continental rider at team Leopard, 10th of the world junior championships two years ago, winner of the Games of the European States this year, 15th of the European championships a few weeks ago and who comes straight out of the Tour de l'Avenir where he finished 17th of a stage. It was a very strong group of course and, although De Vocht and Legand were dropped in the climb of Beaufort, with 45 kilometers to go, the 5 survivors were more than 2 minutes ahead of a group of a dozen chasers including, among others, the Luxemburgers Mike Diener, Tim Diderich, double national champion, and Philippe Herman, also a former winner of La Charly Gaul (in 2006). Sandro Dostert and, a little bit after him, Anthony Spyschaert were also dropped at the front of the race and so they were only three left in the final to battle for the win: Centrone, Leyder, Glorieux. The two Luxemburgers attacked in turns during the last 15 kilometers, leaving Glorieux behind for an duell to the line. Pit Leyder seemed to be good for the win under the red flame, but Centrone managed to return a few hectometers later, immediately passed him and took the win with two seconds advantage. 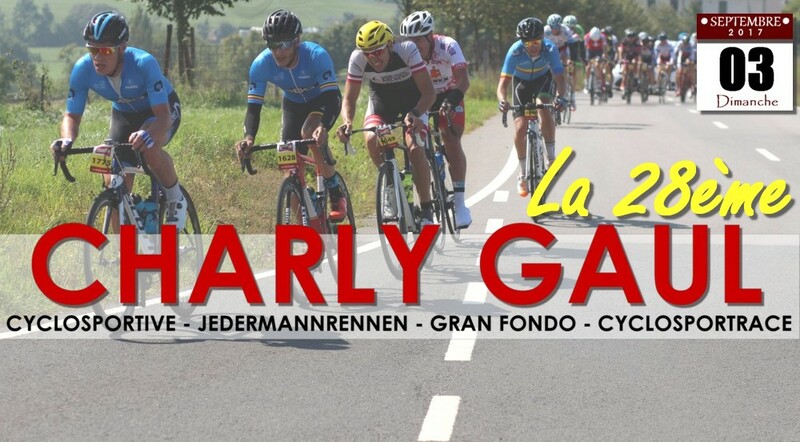 The Team Differdange rider thus wins La Charly Gaul for the second consecutive year, ahead of Leyder, with Frederic Glorieux finishing at around forty seconds for a third podium in as many years. Anthony Spysschaert and Sandro Dostert took positions four and five, resisting the return of the first chasers led by a Tim Diderich who end in sixth, 5 minutes away from the winner. Four home riders among the first six, it has been a long time since this had happened. In the LADIES race, two competitors were clearly above the rest and they managed to jump on the good train of the men's peloton in the first kilometers to eventually finish the race together, less than half an hour behind the male winner. After 4 kilometers of racing, on the top of the Berdorf climb, German Janine Meyers was the first lady to pass, about thirty seconds behind the top of the race and a few meters ahead of the Belgian Ils van der Moeien. Less than a minute behind, duathlete Marina Van Dijk, triathlete Marjolein Truyers, time trial specialist Maaike Shakenbos as well as Ingrid Stolwijk, 6th last year, and Manuela Freund, 4th two years ago, were still hoping on a return to the race head. But the groups didn't come together before the next climb in Hoesdorf: Van der Moeien and Meyer found themselves together in a second group, one minute behind the men's leader Ivan Centrone, but the next big group with Truyers, Van Dijk and company was already more than three minutes behind the front after twenty kilometers of race. The gaps continued to increase and, at the start of the climb of Beaufort, well after mid-race, the two leading girls were nearly ten minutes ahead of third-placed Marjolein Truyers, who had herself distanced Van Dijk and Solwijk by more than four minutes. The victory was thus to be decided between Janine Meyer, the German winner of the Endurance race on the Nurburgring, at the end of August this year, ahead of van der Moeien precisely, and the Belgian, who has already won some of the biggest cyclosport-races of the planet: the Marmotte, the Trois Balloons, the Ötzthaler Marathon or the Gran Fondo Eddy Merckx. The decision between them fell only at the very end of the race and, under the red flame, the two ladies were still together in a group of about twenty men. Placement in the group was most important for the decision and, if Meyer was not able to avoid the tail of the group in the very last meters, Van der Moeien managed to stay at the front, finishing 93rd overall in the sprint and winning the women's race just six seconds and a fourteen positions ahead of Janine Meyer. Marjolein Truyers finished third in the women's standings, more than 12 minutes behind the winner, while Van Dijk, Stolwijk and Schakenbos competed for positions 4 to 6 in another sprint, another four more minutes later. As the fog dissipated around the basilica, one hour after the departure of La Charly Gaul A, the mayor of the city of Echternach himself also took the start of his race on the market place, together with more than 800 other competitors for the distance of 102 kilometers. As in the other race, the climb of Berdorf was carried out in great speed, but despite the high rythm imposed among others by the Belgian Remy Dechambre, the peloton remained more or less grouped at the beginning of the race. Dechambre insisted a little bit later and escaped on the climb of Hoesdorf, after twenty kilometers of race, together with Sebastien Pepinster and Laurent Donnay. At the summit, the three Belgians were thirty seconds ahead of the chasers, a group of a hundred riders in which their compatriots were also in the majority, but which also contained a number of riders from Luxemburg. Pepinster was dropped after that but was replaced at the front of the race by home rider Philippe Schmitt, while the first group of chasers still counted some thirty riders on the heights of Mont-Saint-Nicolas. Dechambre, a member of the team Veranda Willems CC Chevigny, with whom he had ridden among others the Triptyque Ardennais this year, Donnay, a former Continental rider who finished second in the Tour du Faso down in 2008, and the surprising Luxembourger Schmitt insisted at the head of the race and they were soon 35 seconds ahead of a solitary chaser and had a minute on the first major group, of about fifty riders now. The gap however decreased in the climb of Beaufort, where the chasing group led by Lorenzo Marasco and Philippe Reuland was 45 seconds behind the leaders, with one rider still in between. The inevitable occurred several kilometres later: in the climb of Herborn, less than 20 kilometers from the finish, the three leading men were caught in several waves by some thirty riders, including Luxembourg's Rick Stemper, Raphael Schweitzer, Philippe Reuland and Luc Weis, triathlete Bob Haller as well as Gody Jacobs, 5th last year, Romain Wolkowitz and Ludovic Brochard, both in the Top 5 The Charly Gaul 2015, the Bulgarian Spas Guyrov, the Masters rider Gary Maher and the German Boris Odendahl, who is not unknown in the races in and around Luxemburg. The decision was to be made amont them and it fell in the very last kilometers: Rick Stemper and Jernst Tempelaar were able to obtain a slight advantage under the red flame to fight out the victory. In the last corners, the Luxembourg junior was stronger than the Dutchman and broke two seconds ahead: Rick Stemper won his first Charly Gaul ahead of Jens Tempelaar. Ten seconds after them, a bunch of Belgians took the next places: Dechambre, Ramaekers, Donnay, Wolkowick and Van Weerst in this order. At twenty seconds, Luc Weis finished eleventh of the race, being the second Luxembourger in the rankings. In the WOMEN's race, one rider clearly dominated the event: Anne-Sophie Harsch took the lead in her category very early in the race and remained for a long time in the first large male peloton, finally winning exactly 5 minutes ahead of the second lady, Claire Faber. As of the climb of Berdorf, the Luxemburg U23 champion was very strong, she made a thrilling start in the company of the best men: after about ten kilometers, she was only only about twenty seconds behind the leader of the common race. At the same time, junior national champion Claire Faber was already one minute behind her compatriot, together with Belgium's Annick Dirckx, winner of La Charly Gaul in 2015. Nathalie Lamborelle, also a double winner of the race, followed thirty seconds later with Nathalie Moreau and Anne Pons, the French and the Belgian. Germany's Friederike Dietzmann and all the others were already more than three minutes behind the first lady after the first climb of the day. After mid-race, Harsch was still very well placed: in the climb of Beaufort, she rode near the Top 50 of the race, in a third group that was less than 5 minutes behind the leaders and four minutes ahead of Claire Faber, who had left behind her Annick Dirckx. The Belgian now rode together with Nathalie Lamborelle, the good surprise of the Bieles cyclo-cross worlds and they were only a minute behind Faber. In the second half of the race, Anne-Sophie Harsch was slightly weakening, but het margin was largely sufficient: the member SAF Cessange took a very good 89th place in the scratch classification, at an average speed of 34 km/h and only 13 minutes behind the male winner Rick Stemper. Claire Faber finished fifty positions later, with a 5-minute deficit on Harsch, but still a great average speed of more than 33 km/h. Not far behind, Nathalie Lamborelle completed a 100% Luxemburg podium by finishing 163rd in the scratch rankings, in a sprint ahead of Annick Dirckx.